April 2017 - that's when demolition began for our house remodel!!! 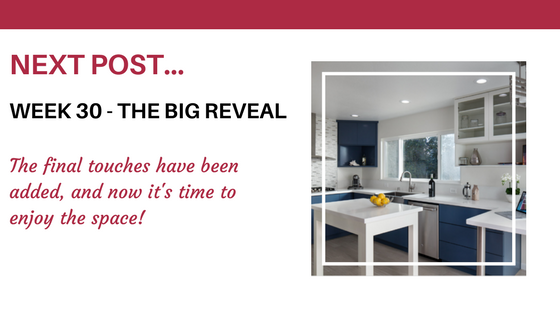 The "Diary Of A House Remodel" series has been a perfect case study for the inner workings of a remodel...and how even the best laid plans can be impacted by unexpected (and uncontrollable) events. Choosing the right area rug is so important - especially in a relatively small space. This beautifully patterned rug is the main source of colour in this living room, and provides a central point around which all other elements and colours revolve. All too often, we have a solitary wall which we "can't do anything with." ape/size makes it difficult to display much on it. This is often the wall at the end of a hallway...and most often a mirror gets put up on it. So I ask myself, would I rather see myself each time I walk down that hall (think first thing in the morning...not a pretty sight for most of us!)...or... would I prefer to see something that brightens my day and make me smile. From the start, I knew this wall was begging for a mural, and this pretty blossom did the trick. For added "oomph" in the evenings, a couple of floor lights help to display its beauty. Who doesn't love a chandelier, and with the overwhelming selection available to us these days, there is something to suit every personality and design. And for my Clients, it's this "sputnik-style" chandelier. Check out its full design impact in the next blog post where we reveal the entire design. ed for a cozy day/night in. Its crisp white finish provides a wonderful contrast against the blues in the rug, and pretty much everything around, and on top of it.